As someone who regularly critiques movies, I’ve been able to better see how a movie is broken apart, though despite my keener eyes I still enjoy the experience of sitting in a theater. However, unless you just happen to live in a large enough community, many people often miss some of the better cinema gems to the usual flow of blockbusters. This is where the rental experience can pick up the pieces, giving viewers the chance to see something otherwise lost. When I saw this movie I had no clue about where it came from or what it was about, but it was another experience that proves exposure does not guarantee quality. “Good” takes a real world tragedy and allows audiences to reexamine another angle with a fictional creation. From the History Channel to countless big screen or video game adaptations, World War II is a subject that has no shortage of documented media. This particular flick is a part of that growing library, but instead of picking the usual cast of Nazi characters and retelling the horrors, this was taken from a fiction stage play created in the 1980s. 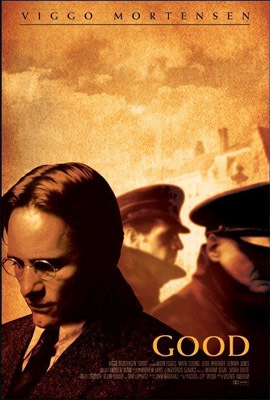 It focuses on the life of John Halder (Viggo Mortensen), an author/professor who is just trying to live life as a respectable citizen when a book he has written is chosen to promote the Nazi Regime. 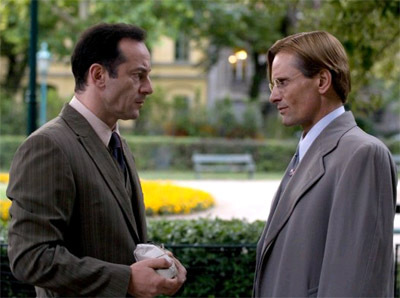 He starts out simply working with the party to make ends meet, but despite his efforts to avoid getting pulled in too deep he finds everything increasingly strained from his marriage to his wife Helen Halder (Anastasia Hille) to his best friend and former comrade in arms, Maurice Israel Glückstein ( Jason Isaacs). Since I have not seen the stage play I can’t comment on how well it has been adapted, but I certainly would not pass on seeing the first version. What this story does best is portray the fact that while the evil things done by those who held power in Germany at the time can never be dismissed, there were still genuinely good people who could not figure a way out. The only problems with this were that at times one could not hear everything that was being said (bad audio) and at times if you weren’t paying absolutely close attention you could be temporarily lost. I would recommend this as a teaching tool as well as a film for most ages, though some of the content is of the R rated variety. I am glad that I happen to see this buried among dozens of popular offerings and though I did not get to see it when it premiered on a limited basis in 2008, felt it was worth the wait. For decent acting and a tale that serves as another reminder to be vigilant, I give “Good” three and a half out of five stars. DVD rental courtesy of Family Video of Pauls Valley. As diverse as audiences are in their tastes, there can be few if any one size fits all statements when it comes to favorite movies. However, one generalization that has comes the closest to not being totally off base is that for the most part it’s better to not have read a book that inspired a movie before one sees the silver screened version. As time management is not my highest rated skill, this was not a problem for me with this film, though from the dissatisfied groans I’ve heard from the fans of the novel behind this thriller of sorts, it might have not earned the score I have set aside. Overall, I was decently satisfied, which is saying a lot for a genre I don’t count as a favorite, but it isn’t something I’ll rush to see again soon. “The Lovely Bones” in some ways felt like something of an independent approach, though in other ways a blockbuster thrown to appease the make it pretty crowd. One of the positives that was a deciding factor in why I chose this DVD rental is that Peter Jackson is the director. Due to a combination of usual Hollywood delay tactics and Jackson not taking on 30 projects at once, the story felt like it was given enough time to develop. Said tale focuses on Susie Salmon (Saoirse Ronan), a 14-year-old girl who is murdered and while waiting in between the real world and the afterlife, tells of the crime that seems to have no justice in sight. 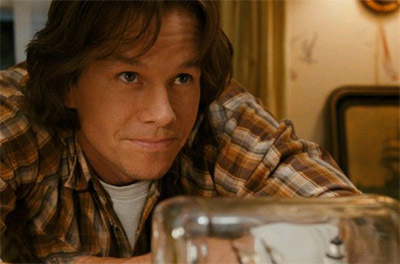 The tragedy threatens to tear the family apart from her dad, Jack Salmon (Mark Wahlberg) who is determined to find the scum responsible at all cost to her mother, Abigail Salmon (Rachel Weisz) and grandmother, Grandma Lynn (Susan Sarandon) who each have their own way of just trying to make it another day. All of this is done in a way that conveys a near brilliant sense of urgency that eventually builds toward an ending that may satisfy in ways the audience does not expect. While you felt pulled into the moment, there were several segments for all but a few characters where things felt flat or confusing. The characters that won it for me were Jack, Susie and perhaps most of all, George Harvey (Stanley Tucci), who almost pulled off the creepy guy role to Hannibal Lector levels. Because of the subject matter, the PG-13 rating might be a bit tame, so practice some care if you plan on watching this with anyone but close to adult age. In the end, it was at least something that made for a relaxing couple of hours, which seems to become rarer as I take on more projects. 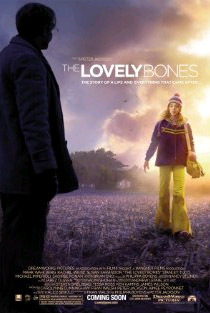 Since all good or bad things must come to an end, I give “The Lovely Bones” three out of five cold cases. DVD courtesy of Family Video of Pauls Valley. Past Entertainment: Halo Reach and Owls of Ga'Hoole Reviews.